With the advent of smart phones, software that was previously only available on computers are increasingly taking the step from your desktop into your pocket. This is very good indeed. I consider finding efficient ways of learning vocabulary to be one of the cornerstones of good language learning, and spaced repetition software such as Anki is perhaps the most important part. Even though it should be obvious that it’s a good idea to run SRS on a mobile phone, I still waited for quite some time before I bought a new phone running Android, thus enabling me to carry Anki with me. With the benefit of hindsight, I should have done that a lot earlier. If you’re serious about learning any language, having the option to review vocabulary anywhere is worth the price of a new phone without the slightest doubt, even if you don’t use the device for anything else. If you haven’t got a smart phone, you could buy a cheap one just for this. If you’ve already got one, you should start using it to review vocabulary immediately. The reason why it’s so great to be able to review vocabulary on the move is most easily explained through the concept of time quality (read more about it here), which in short means that there is time with different levels of quality. If you’re at home and have access to the internet, books and a reasonably peaceful studying environment, this is considered the highest quality time, because you can spend this time on virtually anything you like. On the bus or waiting for a friend, however, your studying options are severely limited, or in other words, the time quality is lower. The great thing with vocabulary reviewing on your mobile phone is that it allows you to do something which might at first sound trivial, but which is incredibly important: it allows you to move a very time consuming task (reviewing vocabulary) to several shorter stretches of time of significantly lower quality. Since it’s not wise to use time of higher quality than necessary, spaced repetition software on your phone allows you to do more with the high quality time you have at home. I know from personal experience that keeping a large volume of vocabulary active is a time-consuming task. I typically spend around forty minutes every day maintaining a deck of around 20 000 words. This is not a lot of time if your studying full-time, but I can hear readers mutter that they don’t have that much time. There are two ways to respond to this. I could say that you’re right, but that you probably won’t have a deck that large so you should be okay. This is the pre-smart phone answer. Having used Anki on my mobile for a couple of months now, I can also say that you’re wrong if you say that you don’t have time. Very short periods of time, sometimes only a minute, add up quickly over the day. Before I bought my smart phone, I usually needed to pay attention and plan when to review vocabulary, because otherwise I would be hopelessly behind schedule. Now, my review queue is constantly at zero and I’m considering adding vocabulary more quickly to make better use of the time. Time I thought that I didn’t have before buying the phone! This means I free up much time to do other things, including working or other important things I might have to do. The conclusion is that a smart phone is an invaluable tool when studying Chinese. I bought mine a few months ago, a really cheap one from ZTE costing only $160, but it’s still heaven on earth. If I had realised how big the benefits were in practice, I would easily have spent five times that much two years ago. It’s perhaps difficult to convey this insight, but if you haven’t tried it yet, just trust me when I say that it’s better than you think (yes, it’s even better than you think after you have read this article). So, what phone to buy? I don’t think it matters much. I don’t particularly like Apple, so I bought an Android phone instead. The Anki client for Android is free, but the one for iPhone costs $25. Considering that I paid six times that much for the phone, it goes without saying that you iPhone users out there should buy Anki to your phones immediately, not only because it’s awesome, but also because Damien Elmes, the developer, deserves to get at least something in return for all the work he has put into Anki. If you don’t have any software to review vocabulary on your phone, get it without delay. If you don’t have a phone, buy one. It’s worth it. 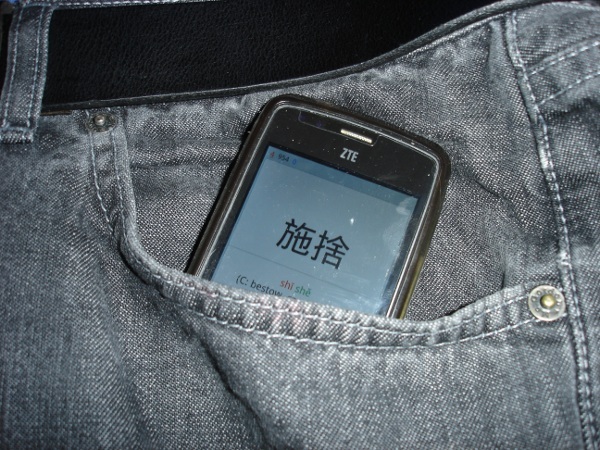 Do you use a smart phone to study Chinese? What do you use your phone for except vocabulary? Do you know of any other useful programs? Yes, I bought a smartphone just 2 months ago for the sole purpose of grinding anki while riding the metro during my stay in Japan. It is without doubt the best thing I have bought in ages. Just found your site, really like it so far, keep up the good work! What kind of deck do you use? Have you made it your self? Just with individual words? Both recognition and production? @Sebastian: Worthwhile, isn’t it? I’ve had my phone for about six months now and I can’t imagine studying without one. It would involve spending so much time in front of the computer, time I’d much rather use for something else. @Jonas: My deck consists of most of the words I’ve learnt since 2008, which is close to 17 000 now. I include both individual characters and words. Occasionally I also add short phrases or sentence patterns. I run all the words from my textbook series from Pinyin to definition and handwritten characters (one card per fact). All the rest I only do recognition. See my article about learning many words for the rationale behind this. Thanks for commenting! hi. What model did you buy? Planning to get one for japanese study so I might get something closer to the specs of what you bought. Those available in my country for cheap prices are quite lame. I don’t know what you consider “lame”, but I bought more or less the cheapest phone I could find which was still able to run Anki. That was a ZTE Blade and I bought it in March. I doubt it’s the best choice now, there should be other cheap models that do the trick. I have a ZTE Blade too, it is a nice phone. But even a Samsung Europa (about $50?) would be fine for Anki or Pleco. I’m currently using an iPod touch which for a cheaper ‘pocket pc’ does the trick of having all the apps but without buying a phone. Of course, then you need to carry it around as well as your actual phone but it’s pretty slight so not too much of an issue. The downside though is that it’s just wifi, so syncing Anki decks between the pc and device needs some aforethought. This also means that I can’t use dropbox for audio… I guess you can’t have it all! As a full time student without a commute at the moment I actually don’t use the Anki on my iPod too much but it was great when going on a week trip away from the pc and utilizing travel time whilst not falling behind! The other obvious use of smartphones is for using them as electronic dictionaries. At the price of a purpose built (clunky, unresponsive, limited etc.) 电子词典 you can straight away download free dictionaries with the chance to buy more if it so pleases you(r wallet). Great suggestions! I don’t use an iPod myself, but I think anything portable for a cheap price will do. Actually, I only sync using wifi today and I don’t really think it’s a problem, because I do have wifi at home and at the university. Sure, I need to remember syncing before leaving home, but that’s usually not a problem. I think that the tools available for Chinese students will explode in the near future. Sure, we already see lots of interesting software, but I’m quite sure that’s just a beginning. It’s a pity I’m not a technology geek, it would be interesting to follow the development. Right now, I’m just happy to be able to keep my Anki queue down to a manageable level without having to sit down in front of my computer. Definitely a dead media form on the way out as phones/tablets get better! Yes, I agree. I bought an electronic dictionary back in 2009 and it’s been incredibly useful, but only because I have neither a phone that is smart enough or a computer that is light enough. Like, when reading in bed before going to sleep, having a small dictionary at hand (which also allows me to save words for later) is quite useful. I second all the comments saying it is worth buying a device just for Anki. However since buying Pleco I have been torn between the two and have stopped studying either… Not great. Pleco’s huge advantage is that you can add words to your deck straight from the dictionary. The two great disadvantages are: no syncing to a server, and it doesn’t show cards piling up if they are left unstudied like Anki – a huge motivational boon in Anki. So…. does anyone have workarounds for the Pleco drawbacks, or opinions on which tool to take the plunge on? I have been a fan of Anki for a while, but this week I started using Pleco and I don’t think I’ll go back. Whereas Anki is for anything you want to learn, Pleco has some features specifically for learners of Chinese. The OCR integration alone is worth the price of admission. Being able to take a picture of some characters and instantly add them to a flashcard deck is great. The Reader integration is also handy. Grab a text file or a section from a website and get annotated reading where you can add unknown words to decks with a tap. The flashcard program itself is pretty powerful. After I’ve tested my recognition, I can go through and “draw” the characters to fill the blanks, which is a much harder prospect. Pleco definitely has some awesome features, but it will have to change quite a lot before I start using it. Realmayo over at Chinese Forums (see the post here) said the following, which pretty much sums up my views as well. Even if some extra features can be added to the Pleco liste, it’s still a long way away from doing everything I want to do. I have the document reader extension on iOS Anki (Android is a bit different, not as many features I think) and it allows me to save tweets, nyt eng-ch articles, any kind of Chinese text and read them on the go. Not a big deal, right? But it has something like the Chrome extension Zhongwen popup feature, so I can read Chinese on the go or while watching tv. Pleco also has multiple add on dictionaries which is quite useful. I have both Anki and Pleco on both my smartphone and tablet though.